Every car owner desires to have the best audio system. Having quality bass from a car music system is crucial in the overall sound experience you get from the car stereo. However, it's quite challenging to get quality bass from your car stereo. Poor bass tends to ruin the entire music experience. Regardless of the kind of car speakers you are using, bass plays a crucial role in the overall music experience. Most car owners are confused about the number of woofers they should install in their car. They often wonder whether one subwoofer will be enough or whether it is better to use multiple ones. While some people find it better to simply use just one, may be due to limited car space, others find it better to use multiple ones. There're many factors to consider when making such a decision, including the space beneath the seats or in the boot and cost. 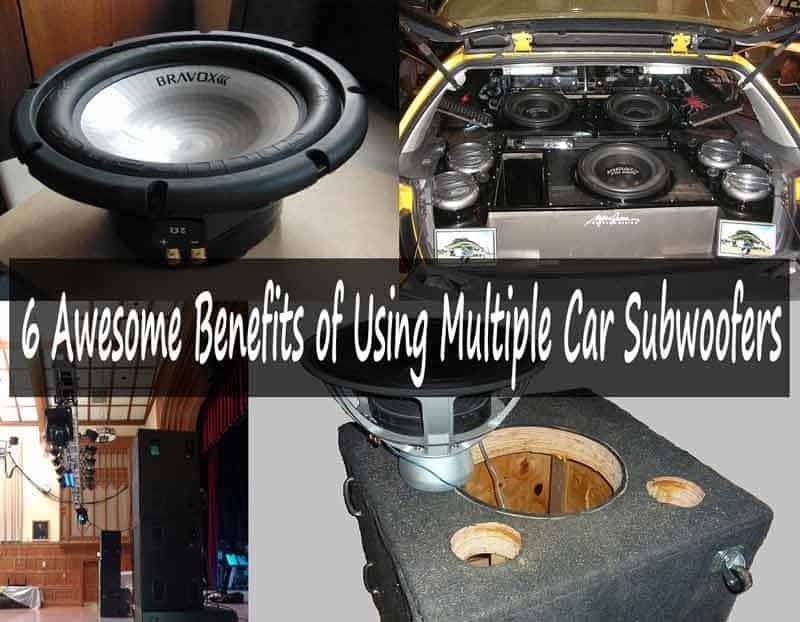 With that said, here are the top benefits of using multiple car subwoofers. One of the key factors that influence the quality of bass you get from a car stereo is room resonance. A car is like an enclosed room. Installing a subwoofer in your car boot or under the seat means that it will be installed in a confined area. The sound waves it produces are reflected from one wall of the car to the other and from the roof to the floor. As such, the sound bounces within the car space. As some point, some frequencies may become louder than others while playing music due to the bouncing sound waves. This interferes with the sound waves such that some of the bass becomes weaker. You may try to use your car stereo equalizer to balance the sound, but by doing this, some listening positions may be affected such that a passenger may have to keep shifting from one sitting position to another. Luckily, you can reduce resonance within a car by adding the number of bass sources. By multiple sources of bass that are properly placed in a car, you will reduce the interference of sound waves and frequencies and also reduce bouncing of sound waves. This results in smoother frequencies regardless of where you are seated. With multiple bass sources, you will find it easier to equalize sound unlike using a single source of bass. A single source of bass can be compared to one standing fan in a room. The fan will only offer cool air within a limited space. On the contrary, using multiple ones is comparable to a central hanging fan that offers cool air throughout a larger space. Two or more sources of bass are able to cancel most of the room resonance within a car. Besides improving the quality of base, they also improve the experience of listening to music regardless of the seating position. Whether you are seated at the back or front of your car, everyone will enjoy high quality bass. Thus, more subwoofers will offer more bass to a larger space within a car. Another major benefit of using multiple bass speakers is getting sharper sound with enhanced clarity. Rather than using a single, large bass speaker, it's advisable to use multiple ones in a car. Running multiple, smaller bass sources in a vehicle offers louder bass that is sharper and with enhanced clarity. Subwoofers usually work by how they displace air within a space. Thus, multiple ones will offer clearer sound than a single since they are able to displace a larger amount of air. Using two or more woofers naturally outperform one woofer of a similar type. In most cases, multiple, ones perform better than one bigger woofer. This is because multiple ones offer more headroom such that the quality of bass you get is enhanced, thereby offering smoother bass. Moreover, multiple woofers reduced compression, enhances dynamic range and reduces distortion. The end result is having smooth, effortless bass. By using multiple car subwoofers, you are able to utilize a 2 channel sound system and this makes it possible to preserve bass from the music system. This way, imaging is also enhanced and soundstage is expanded. This is especially important when using smaller speakers in your car music system. For instance, if your car does not have enough space for one large woofer, it will work best with multiple, smaller ones for they will offer an enhanced stereo effect unlike using a single bass source. Even the best positioned, single woofer may be inefficient in the sense that listeners may often fail to hear deeper octaves. Thus, listening to bass from a single bass speaker makes listeners to feel as if the sound is coming from one specific location. Luckily, using multiple subwoofers in a car will eliminate this challenge even if they will be connected to a monophonic channel. With multiple ones, listeners will hardly feel where the bass is coming from. They will feel like it is coming from all over the car. This way, localized bass is eliminated and this enhances the overall music experience. Using multiple sets of bass speakers does not mean that they will take the entire space of your boot or below the seats. You can actually go for multiple, smaller ones to fit in any limited car space. Two or more small ones will actually offer better performance and less visibility unlike a single, bigger woofer. With that said, when planning to set up a car music system or upgrading the existing one, go for two or more car bass speakers rather than a single, larger piece. Even if your budget may be a major concern, two smaller sets may actually cost around the same price as one, larger set. Moreover, if you care about aesthetics in your car, multiple, smaller sets will actually look more attractive than a single, bulky set. They will create a better visual impact such that you will always be proud to open your boot anytime, anywhere. Thus, there is no doubt that using multiple car subwoofers comes with more benefits than using a single set.